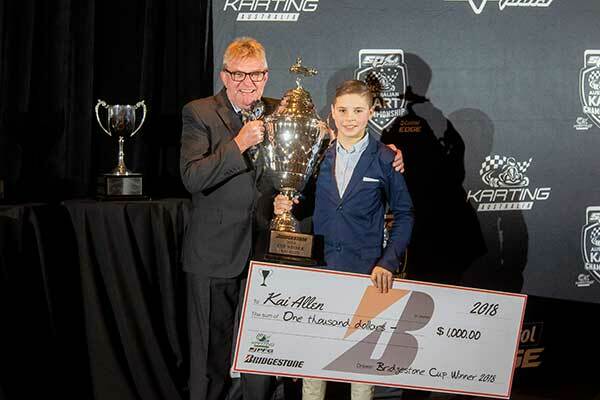 Mount Gambier racer, Kai Allen has been adjudged the Bridgestone Super Cup winner for season 2018 at the SP Tools Australian Kart Championship. He received a $1000 cheque and the Bridgestone Super Cup Trophy that stands almost one metre tall. The Bridgestone Super Cup is awarded to the driver that officials and Bridgestone Kart Racing Tyres importer, Paul Feeney Group feel as though has carried themselves the best as an overall package, taking into account on-track performance, off-track presentation, sportsmanship and treatment of officials and fellow competitors. Allen was thrilled when his name was read out as the Bridgestone Super Cup winner. “It is pretty exciting to win, I didn’t expect to win this Award at all as some of the other drivers were really strong. I can’t thank Paul Feeney and Bridgestone Tyres enough for the opportunity they have presented with the Bridgestone Super Cup,” said Allen. Paul Feeney – Managing Director of the Paul Feeney Group – paid tribute to Allen’s stellar year that saw him win the Vortex DVS KA2 Championship and run the Bridgestone Tyres-shod KA4 Junior right to the final race of the year. “Kai’s a perfect demonstration of how to go about racing,” said Paul Feeney Group Managing Director, Paul Feeney. “He always has a smile on his face, works hard at it and races hard and clean. “He goes about his business in the right way and that is exactly what we’re looking for in a Bridgestone Super Cup recipient. “When Kai was presented as one of the options for the Bridgestone Super Cup, I had no hesitation in agreeing. Kai Allen joins Ryan Tomsett and James Wharton as winners of the Bridgestone Super Cup. The Bridgestone Super Cup will be back in season 2019 with the Championship calendar expected to be announced soon.